Why do we keep so much stuff? A little while ago I wrote a post on Money Bulldog showing how you can raise a bit of extra cash just by having a spring clean. One of the things we mentioned involved selling a bit of your old junk online or in an old fashioned car boot sale. One of our friends did a car boot the other day and she managed to raise £60 in just one morning, not too shabby. After watching an episode of the television program ‘Business Boomers’ looking at the growth of the UK self-storage industry though, it highlighted that getting rid of stuff is a lot harder for some than it is for others, with some people spending around £400 a month on their self-storage habit. That’s not far off the cost of a second mortgage for some people. So why are we so addicted to keeping stuff? What things do people keep? While some collectors were stashing away collections they had built up over years – the guy who was spending £400+ a month was into Star Wars by the looks of things – most of the stuff people were storing looked remarkably similar – Cd’s, baby clothes, old pictures, first bikes and a huge array of other items that they simply couldn’t bear to get rid of. Over the years my wife and I have had many debates over which things we should keep, and which we shouldn’t. We have two young boys and I have to admit that even though I seem to be a lot less sentimental than Mrs. B, some things still hold a lot of memories and can be difficult to get rid of and I think it would be fair to say that I too have a fair bit of stuff stored away that I really don’t need anymore, the basketball cards I collected when I was a kid and the box of Cd’s that I’ve been intending to put onto my iPod for about the past 4 years come to mind. Where is the line though? So we can see that most of us want to keep some stuff, which is perfectly acceptable. The question is at what point do we say enough is enough? If your hoarding habit is bringing you to a point where you have to call in outside help and rent some extra storage space, is that the point where things have already gone too far? As I said the amounts of money that people were spending on their storage habit weren’t small at all, with even a small storage area in one of these big storage buildings being quoted at around £80 per month. Where would you draw the line then? So I’ve admitted that my wife and I both have some pretty pointless things stashed away, things that that we rarely look at. We also have some quite important and meaningful memories stored away too. I don’t think I could ever allow this hoarding habit to progress to a point where I was having to pay for expensive storage space though, I’d have to have yet another clear out. On the flip side we have had quite a lot of these clear outs over the years and I think if we did need to have another one, it might start to get quite difficult to part with the few things/memories we have left. The other thing worth mentioning is that we are both still relatively young – neither of us has reached 30 yet, though I’m getting very close. 🙁 So basically we have years of memories still ahead of us, memories which will likely involve more items that we will want to keep if we have a chance. As you can probably tell I’m getting more and more confused about where I stand on storing stuff as I’m writing this post. In principle, I don’t see the need to store and hoard, yet in reality I do still tend to do it and I know I will still do it in future. So I suppose the question is, where do you draw the line? I can’t imagine that I could ever bring myself to pay large amounts of cash to store our belongings in a big branded self-storage centre but could I be tempted to rent some cheap garage space in future? Only time will tell I guess. Do you have a tendency to store stuff and would you pay for storage space? 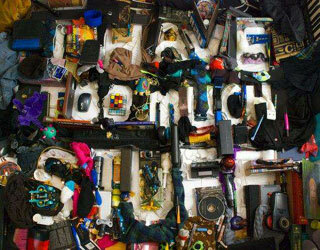 11 Responses to Why do we keep so much stuff? I could never imagine renting out a storage space for things. I am always getting rid of things. When I buy new cloths, I make myself get rid of something I haven’t work in a while because chances are if I haven’t worn it in the last year, I’m probably not going to wear it. Yeah I really don’t think I’d ever pay for space either Don and that’s very true about the clothing. It’s interesting that you mention the programme on BBC2 last week as I was watching it too, and no surprise us Brits do keep a desperate grip on all our old… ‘stuff’. A lot of it just needs to be recycled or discarded. I’d personally draw the line at having to pay for storing anything. Simply forking out a few quid is madness, but £400!? Surely anything worth keeping for emotional reasons should be in your home or that of one of your family’s, like a parent’s garage etc. Anything else just needs to go! That’s what I think Alex. I’m quite happy to store things that have sentimental value but I wouldn’t pay to do it. As soon as you’re storing it outside of your home there is also the danger that the stuff just sits there never being looked at while your bank balance constantly depletes. We don’t end up keeping things because of a desire to hold on to them. We end up stacking up stuff because we lack time to deal with it. So we just put it in the basement to deal with later. Then, instead of getting rid of it a little at a time, we have to make a huge effort and take lots of time to deal with it. I don’t really like doing that. Yeah I know what you mean Brian. It’s a little bit like doing the bookkeeping for your business, if you do it regularly then it’s not all that difficult but if you only do it once a year then it becomes a total nightmare! I find that the minute you get rid of something, you find that you really could use it. But as I start to downsize, I realize I will probably never need much of my stuff. If I go camping, i will have better equipment now. Scuba diving, I will have new stuff. I can get rid of the old. It does seem to work like that doesn’t it, you finally bring yourself to part with something only to find yourself needing it a week later! My wife and I draw the line by using the question “When was the last time we used this?” If it’s been months, OR we can’t remember…it’s gone! Getting rid of extra stuff is a lot difficult, it is better if you review all the stuff for which you are looking to hire a self storage. Make sure your storage cost doesn’t exceed the actual price of your stuff.